I hate veggies. I’ve never liked them and would never order them at restaurants. OK, maybe not all veggies – I am partial to French beans, carrots, watercress – but only my grandma’s watercress pork rib soup – peas, enoki mushroom and potatoes. Everything else in the vegetable category: no, thanks. Growing up, vegetables always tasted like plastic to me and, thankfully, my Tiger Mum never forced me to eat them. So, I was obviously surprised when my editor asked me, a lifelong unwavering carnivore, to taste some interpretations of the meat alternatives Beyond Meat and Omnipork at speciality restaurants in Singapore. I decided to accept the vegetable challenge as an opportunity to widen my culinary horizons. To my astonishment, all the plant-based dishes I sampled far exceeded my expectations and were delicious and mouth-wateringly creative. I never thought the day would come when I would admit I now enjoy food that hasn’t got any meat in it. Here is my review of 7 impressive vegan-friendly establishments in Singapore. I can also humbly report that I’m now taking baby steps to embrace vegetables. As much as I once detested vegetables, I love pork. 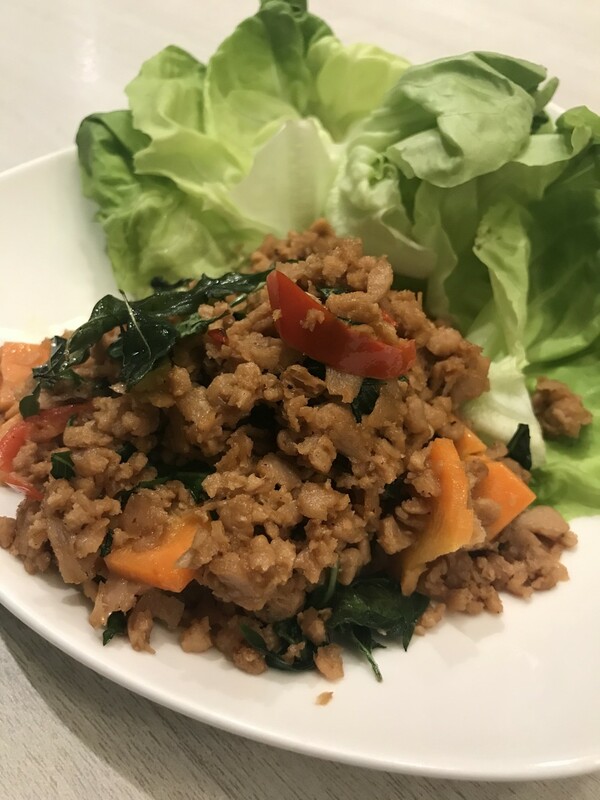 Pad krapow, a dish of minced pork with Thai basil, is a favourite. So, when I was told I would be sampling the Omnipork version of pad krapow at Novotel’s all-day dining restaurant Food Exchange, I wondered what the vegan version would taste like. Turns out, it wasn’t that different. The texture of the Hong Kong vegan brand’s Right Treat’s proprietary blend of pea, non-GMO soy, shiitake mushroom and rice felt surprisingly like the original porky version. And with 70 per cent less saturated fat, 62 per cent fewer calories and 53 per cent more iron, I am now wondering if I should switch permanently to the vegan counterpart. 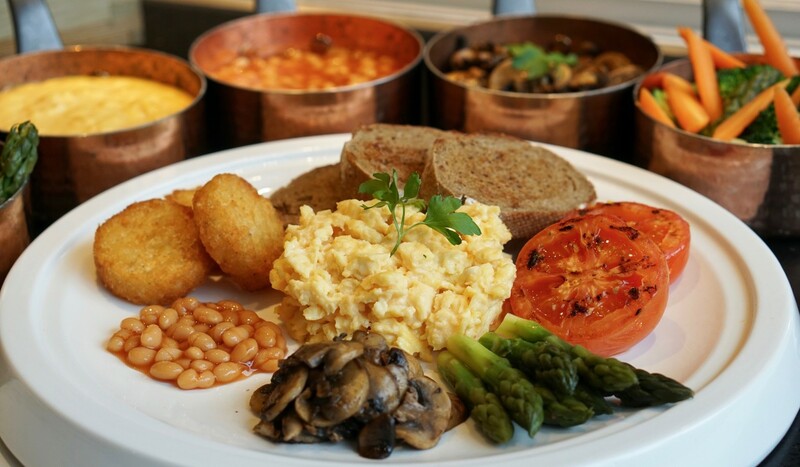 I also tried the scrambled vegan JUST Eggs, which the hotel serves on its à la carte menu for daily breakfast and offers free with its buffet breakfast every Monday. While I enjoyed the eggs, I could tell the difference in the taste and texture of the dish. Primarily made of mung beans, turmeric and canola, it was a little too mushy. I moved on to Winestone, the hotel’s modern European restaurant on the first floor to try the Beyond Burger and Beyond Meatball. Both dishes use the plant-based meat substitute company’s products, which consists of pea protein, canola and coconut oil. I could instantly tell the Beyond Burger, while it did satisfy, was nothing like a regular juicy cheeseburger. The Beyond Meatball, however, blew my mind. It tasted and felt like a normal meatball made of, well, meat. It even had the crunch of a meaty meatball and the tomato sauce it was bathed in was sweet and tangy. All dishes are labelled vegetarian on the menu, but vegan options are available upon request.From vegan to flexitarian – what’s the best diet for you? My fellow temporary vegetarians for the day and I came prepared with empty stomachs for our two-part review at The Fullerton Hotel Singapore. First, we gathered at Town Restaurant to sample the Beyond Burger which arrived with a generous helping of French fries. The Beyond Meat patty was nice and thick topped with an interesting slice of vegan cheese made of peach gum. It was our first encounter with this ingredient. It didn’t melt on the burger like it would on a classic cheeseburger, and it also had a much firmer texture. Overall, we thoroughly enjoyed the Beyond Burger, but it didn’t fool us meat lovers. Next, we made our way downstairs to Jade, the hotel’s elegant Cantonese restaurant. Before this review, we had always wanted to visit Jade because it is said to serve one of the best siew yuk dishes in town. We certainly did not have any roast pork during our tasting session but we’re happy to report that the Taste The Future vegan menu didn’t disappoint. 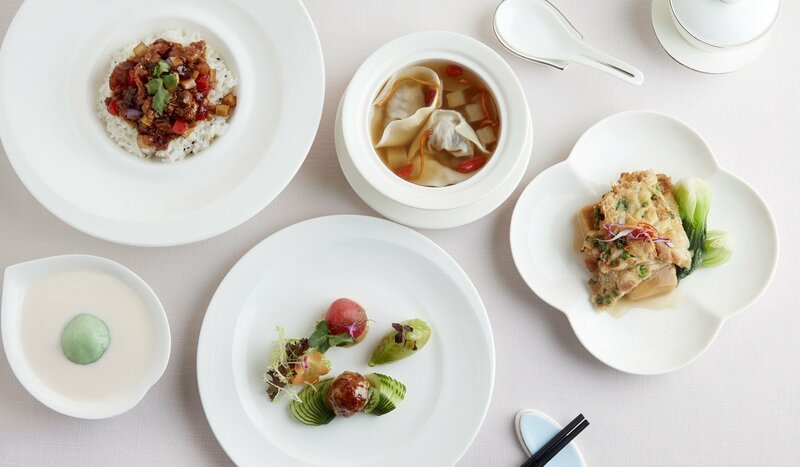 While vegetarianism has long existed in Chinese culture and belief, veganism is primarily a Western practice, so it was a pleasant surprise to try an all-vegan modern Cantonese-style menu created by executive chef Leong Chee Yeng. It’s not hard to see why this plant-based restaurant with a Michelin Bib Gourmand is known to locals as the vegetarian restaurant for non-vegetarians. Albeit a little pricey, this Peranakan-Thai vegetarian eatery’s menu is not pretentious – we could tell that all the familiar local dishes that had been given a vegetarian spin were all cooked with love. A stand-out was the Omnipork elephant toes, or meatballs. Perfectly cooked, it was a simple meal, but felt like an elevated dish to us. The chef’s take on pad krapow – named sawadee larb – was super delicious, too. It had just the right amount of chilli and spice to heat things up. Don’t leave without trying their signature sweet & sour delight, a plate of tofu and pineapple chunks that had us convinced we were eating a real sweet & sour pork dish. It was sticky, tangy and crunchy all at the same time. Bring the family or round up your best buddies because there are choices here that you should not miss. The generous portions they serve are sure to satisfy. What we liked about this 100 per cent vegan rooftop establishment is their additional offering of Beyond Burger in a local interpretation that changes seasonally on top of the classic cheeseburger style. Currently, HRSVT (pronounced “harvest”) is giving the Beyond Burger a Szechuan twist by marrying the Beyond Meat patty with a slice of Szechuan powder-dusted pineapple, along with thin dough crisp crackers and the eatery’s own Szechuan “mayonnice”. HRSVT only serves Beyond Burger for lunch but we’re hoping that they will include it on their dinner menu soon. Want to take a break from the classic cheeseburger and try something new? This multi-concept restaurant might just have what you’re looking for. Aside from the classic hamburger made with a Beyond Meat patty, we also liked the restaurant’s modern Asian burger which combines the Beyond Meat patty with Asian slaw, avocado, furikake, sriracha, pickled daikon and ginger, and wasabi mayo before topping it off with two corn buns. It’s a refreshing interpretation with just enough heat to tickle the taste buds. Here, you have a choice of four sides to go with your burger: sea salt fries, crispy organic cauliflower with toasted seeds, steamed organic broccoli with roasted nuts or ancient grains rice bowl. We recommend you order the set meal and get a kombucha or craft beer and a slice of dark chocolate and organic beetroot vegan brownie to go with your burger. This local gourmet burger establishment has grown to become the go-to place for burger aficionados to get fresh, scrumptious and affordably priced burgers that are not laden with preservatives. We’ve frequented this no-frills burger joint a few times before and loved the beef burgers. To our amazement, they did Beyond Burger justice as well. As a challenge, we did a blind tasting of two cheeseburgers – one regular and one Beyond Burger. Save for the lack of juiciness in the latter (which can easily be chalked up to the meat being cooked well done), we couldn’t tell the difference. Both patties were equally tender and delicious. According to general manager Rayson Lee, it took the in-house R&D team months to replicate the same charred effect of a good old regular cheeseburger in the Beyond Burger. The efforts paid off because, despite containing zero meat, the Wolf Burgers’ Beyond burger was one of the best we’ve had. Coming from meat eaters, that says a lot. 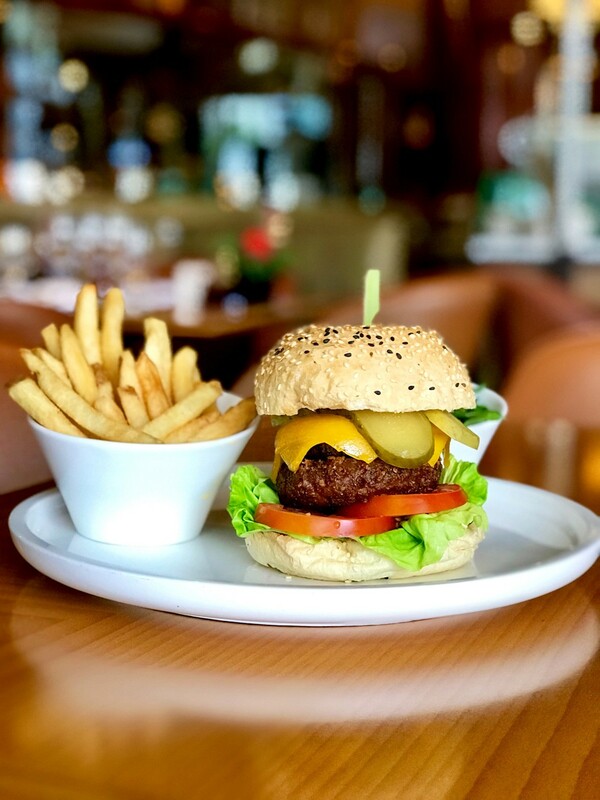 @carvers_x at @asia.square.singapore is now serving the #FutureBurger featuring revolutionary Meat Alternative Patties from @beyondmeat – available from 5pm daily so come out and take a bite out of the Future! Having tried several interpretations of Omnipork, we assumed that another meatball dish couldn’t be any different than the ones we’ve already sampled. But Carvers X proved us wrong with its cheese-stuffed meatballs. Juicy and cheesy with a satisfying bite, this dish ticked all the boxes to the point where we were almost convinced we were eating real meatballs, not the vegan variety. With just meatballs and some leaves, however, it may not fill you up as much as you’d like. For something more satisfying, order the Meatball Xandwich, which is made of the same gooey cheese-stuffed balls dipped in black pepper sauce in a banh mi-style bun, served with fries. By Lynett Yip. This article originally appeared on STYLE under the the title ‘Omnipork and Beyond: what happens when a carnivore samples 7 Singapore spots with vegan dishes?.’ All images & content courtesy of SCMP lead photo ‘Scrambled vegan JUST eggs, made of mung beans, turmeric and canola, at Novotel Singapore On Stevens’.